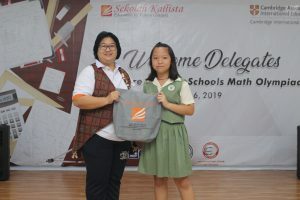 A hundred and sixty students with extraordinary Mathematical skills competed in the Singapore and Asian Schools Math Olympiad 2019 (SASMO) from different schools all over Batam last April 6th 2019. Kallista has been hosting the SASMO event for consecutive years, and 2019 is not an exemption. The event opened with a short program where students from all the joining schools were acknowledged by Cambridge Coordinator, Ms. Lennie J. Jacinto, PhD. 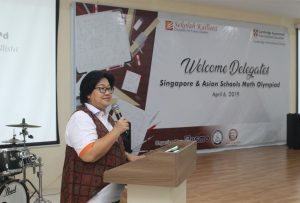 Ibu Megawati, M.Pd, Kallista’s Principal for the Primary Department, welcomed the participants and wished them well in the contest. Students were nervous at first, but eased up later when Teacher Sahara (Emcee) let them answer Mathematics Trivias. Prizes, sponsored by Kallista, were given to students who won the said trivia challenges. Kallista trainers were Math teachers, Teacher Sujar, Teacher Mabel, Teacher Willy, and Teacher Lennie. Teachers from the English department also helped in proctoring like Teacher Sahara and Teacher Yssa. 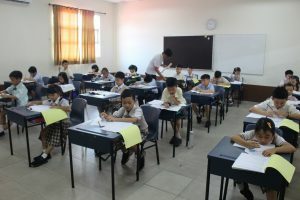 Results will be posted on May 3rd 2019 on the SASMO website.